Along with territorial disputes with Spain and Mexico over the Southwest, the fate of the Oregon Territory was one of the major diplomatic issues of the first half of the 19th century. The territory became a focus of those who believed that it was the United States’ obligation and right to extend its rule and liberties across the North American continent. The Oregon Territory stretched from the Pacific coast to the Rocky Mountains, encompassing the area including present-day Oregon, Washington, and most of British Columbia. Originally Spain, Great Britain, Russia, and the United States claimed the territory. In 1819, under terms of the Transcontinental Treaty, Spain ceded its claims to the territory to the United States. Shortly thereafter the United States contested a unilateral Russian move to grant its citizens a fishing, whaling, and commercial monopoly from the Bering Straits to the 51st parallel. In 1823 President Monroe promulgated his doctrine, which put Russia on notice that the United States did not accept Russian attempts at monopoly. 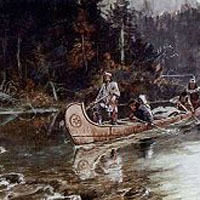 The U.S. claim was based on the explorations of Lewis and Clark and on the establishment of trading posts set up by John Jacob Astor’s Pacific Fur Company, such as Astoria at the mouth of the Columbia River. Great Britain based its claim, in part, on James Cook’s exploration of the Columbia River. As early as 1818 British and American Commissioners had fixed the border between the United States and Canada at the 49th parallel from the Lake of the Woods (Minnesota Territory) west to the Rocky Mountains. The United States had proposed to extend the border along the same parallel to the Pacific Ocean, but Great Britain insisted that the northern border be drawn west to the Columbia River and then follow that river to the ocean. Neither side then budged, but they did agree to postpone the decision for 10 years. 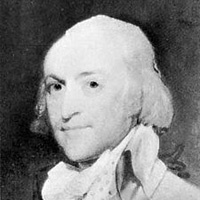 In 1827 Washington and London agreed to postpone the issue indefinitely subject to one year’s notice by either party. There the matter remained until the Webster-Ashburton Treaty of 1842 partially delineated the northeastern U.S.-Canada border, but left the border of the Oregon Territory unsettled. By 1843, increased American immigration on the Oregon Trail to the Territory made the border issue a burning one in Congress, where jingoists raised the slogan of “54 degrees 40 minutes or fight.” President James Polk, a supporter of Manifest Destiny with an eye also on the Mexican Southwest and California, was eager to settle the boundary of the Oregon Territory and proposed a settlement on the 49 degree line to Great Britain. British Minister to Washington, Richard Pakenham, and Secretary of State James Buchanan, supported and encouraged by British Foreign Secretary Lord Aberdeen and Senator John C. Calhoun of South Carolina, worked out a compromise. With some minor modifications, which reserved the whole of Vancouver Island to Canada, Great Britain agreed to Polk’s suggestion. The Senate ratified the treaty by a vote of 41-14 on June 18, 1846. A later controversy over the precise boundaries in the Juan de Fuca Strait was resolved by international arbitration in favor of the United States.